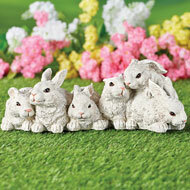 This group of adorable white bunnies is perfect anywhere in your yard or garden! Loaded with delightful details and realistic textures, these rabbits will bring a smile to your face – and they won't eat your flowers! Perfect indoors or outside. Resin. 13"L x 4 1/2"W x 4 3/4"H.
This stunning solar willow tree will make a unique addition to your outdoor décor. 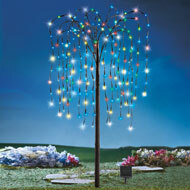 It stands 4 1/2 feet tall, and the adjustable branches hold 200 LED lights for a beautiful show at night. The 3way light switch lets you choose steadyon, flashing or off. Choose between White, Purple or Multicolor lights. Includes 1 "AA" battery. Iron and plastic. 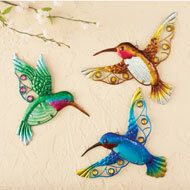 54"H.
These beautifully detailed hummingbirds add color and style to your outdoor decorating all day and night. The three solarpowered birds light up automatically at night. They're all connected to a cord that's plugged into the solar panel that's cleverly disguised as a rock. Includes 1 "AA" rechargeable battery. Resin. Each bird is approx. 2 1/2"L x 5"W x 4"H. 3Piece Set. This colorful stake has a stained glass style design that's lovely all season long. Five bright red poinsettia flowers surrounded by greenery stand tall anywhere in your yard while the yellow lights add a warm glow at night. Plugs into AC outlet. Metal and PVC. 9 1/2"L x 3"W x 41 1/4"H with 48"L power cord. 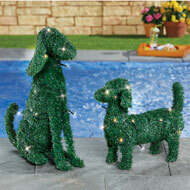 These adorable topiarystyle dogs feature plenty of personality along with lights that sparkle and shine. 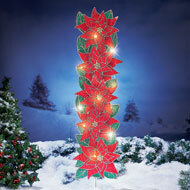 A unique addition to your yard or patio, each features 15 LED lights and requires 2 "AA" batteries (not included). Polyester and wire. Size available in Short Dog: 14"L x 5 1/2"W x 11 1/2"H or Tall Dog: 14"L x 5 1/2"W x 17 1/2"H.
Carefully handpainted with realistic details and textures, this charming tabby cat features sweet eyes and a cute pink nose as he waits for you to play. 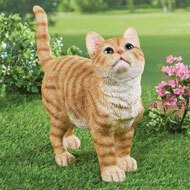 Perfect on your patio or tucked among the flowers in your garden, it's a great gift for any cat lover. Resin. 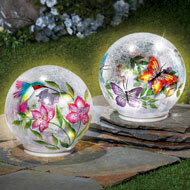 12 3/4"L x 4"W x 10 1/4"H.
Beautifully handpainted with your choice of colorful butterflies or a hummingbird in a garden, this lovely glass sphere shines with sparkling light. The ball features a crackle glass finish and includes an on/off switch with timer function that can light the ball for 6 hours at a time. Each requires 2 "AA" batteries (sold separately). 6"Dia. x 6"H. Styles available in Butterfly or Hummingbird. 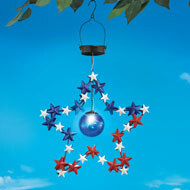 Red, white and blue stars and a blue ball in the center make this solarpowered hanger a festive addition to your yard or garden. The starshaped design features a blue plastic ball in the center that automatically lights up at night. Includes 1 "AA" rechargeable battery. Acrylic, metal and plastic. 12"L x 3 1/4"W x 23"H with hanging chain. 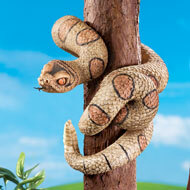 Attach this faux, handpainted snake to a tree in your yard and keep your visitors on their toes! The 3piece set includes a head, tail and center section that each have hooks on the back for easy hanging. Realistic details include a scaly texture, bulging eyes and a forked tongue! Resin. 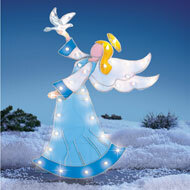 Largest piece is 11 3/4"L.
With a stained glass look, this beautiful angel stands anywhere in your yard while the lights add a warm glow at night. She wears a blue dress and holds a dove. Plugs into AC outlet. Plastic & iron. Includes 30" power cord. 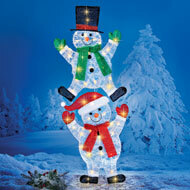 Measures 14 1/2"L x 28"H.
Stake these smiling snowmen into the ground to spread seasonal joy to your friends and neighbors. Festive during the day, the snowmen light up at night for a delightful display. The cheerful snowmen wear colorful hats, mittens and scarves that sparkle. Plugs into an AC outlet. Polyester and iron.  20"L x 50"H. This item can only be shipped to the 48 contiguous United States. Item cannot ship expedited or to P.O. Boxes, APO/FPO. 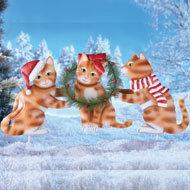 "Purrfect" for the holiday season, this set of cute kitties will welcome your guests and make them smile. Each cat is handpainted with fun and festive details including a bow, Santa hat, and festive scarf, while the center cat wears an evergreen wreath with red berries. Stakes easily anywhere in your yard. Iron. 28 1/4"L x 19 1/4"H.
These smiling snowmen will spread a cheerful welcome to your friends and neighbors! 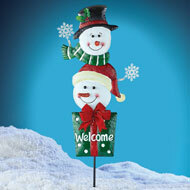 The dimensional stake features two snowmen dressed in winter wear, stacked atop a gift box that reads "Welcome", topped with a bright red bow, along with 2 dimensional snowflakes. Iron. Measures 13"L x 35". 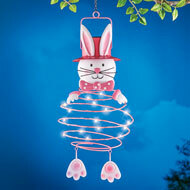 A fun and festive addition to your Springtime garden, this solarpowered lantern features an adorable Easter Bunny design. The bunny wears a pink top hat, polkadot bow tie and his spiralshaped body automatically shines with solarpowered lights at night. It has a hook for easy hanging and folds down for storage. Includes 1 "AAA" rechargeable battery. Iron and plastic. 7 1/4"Dia. x 24"H with chain and hook. 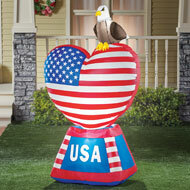 With a colorful flag design, "USA" at the bottom and an eagle perched on top, this inflatable heart is a great way to showcase your patriotic pride. Simply plug it into an AC outlet and it automatically lights up and inflates to over 5ft. tall. Stakes are included to secure it into the ground. Polyester and metal; imported. 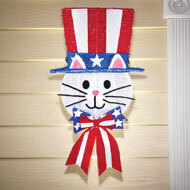 38"L x 22 1/2"W x 62"H.
Greet family and friends with a glowing welcome from this patriotic cat. Loop the elastic cords over your outdoor porch lights and the cute cat dressed in a stars and stripes themed top hat and bow tie glows when the light is on. 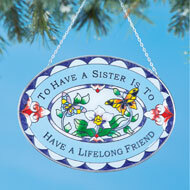 The set includes 2 light covers to flank your front door or garage. Metal and polyester. 8 1/2"L x 2"W x 13 3/4"H.
Add these bright and cheerful hummingbirds to a wall inside or outside your home for a colorful addition to your décor. 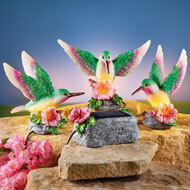 The set includes three hummingbirds with glass bodies and metal heads, wings and tails. Delightful sparkling crystal accents are the finishing touch. Iron, acrylic and glass. Hooks on back for easy hanging. Approx. 9 1/2"L x 9 3/4"H.